My edition: Paperback, to be published on 7 November 2013 by Headline, 334 pages. Description: When Amy Carrell's wealthy boyfriend ends their relationship just before Christmas, she's left to nurse her broken heart alone. With nothing to lose, she replies to an advertisement requesting a companion for a mysterious 'Manhattan adventure'. Whisked off to New York with eccentric British aristocrat Georgia Hamilton, Amy experiences a glamorous side of the city that she's never seen before. Along the way, Georgia initiates her protegee in the arts of old-school elegance. But as Georgia shares her life lessons, Amy discovers a painful secret in her mentor's past. A secret that shattered her future. A story of love and betrayal that only Amy has the power to put right. The Proposal is very much a book of two halves. One part of the story takes place in modern day London and New York, the other in an England of the 1950s where debutantes still roamed the countryside and cities, and status and money very much decided who you associated with - though this hasn't completely changed in the modern day, as lead character Amy Carrell unfortunately finds out first hand herself. Amy is a dancer by profession but after an injury she spends more time auditioning than actually working in London's prestigious West End and so to be able to pay her bills she works as a waitress. Her boyfriend Daniel couldn't be more different; born in a wealthy family he has a shining political career ahead of him and with that a life that can no longer include Amy. He breaks up with her just before the holidays and leaves her heartbroken. Amy wants nothing more than to take the first flight back to New York City and spend the holidays with her family, but as she doesn't have a spare penny to her name she has to be creative in funding the trip. So when she comes across the advertisement of a woman seeking a "companion" for a Manhattan adventure, Amy doesn't think twice before she applies and in no time at all she finds herself on a plane to New York with her new friend Georgia. What started off as a much-needed way of crossing the pond and spending time with her family, turns into much more when Georgia opens up to Amy about the love of her life and her experiences as a debutante in England in the 50s. Through flashback chapters the reader becomes acquainted with the lifestyle of debutantes and the heartbreaking story that tore Georgia away from her soulmate. A few months ago I was fortunate enough to hear author Tasmina Perry speak about her work, and the publishing world in more general terms, at a special Red networking event for budding writers. While I hadn't read any of her books yet at this stage I'd certainly heard about her and her eloquent answers to the audience's equally intelligent questions made me very keen to pick up one of her novels. 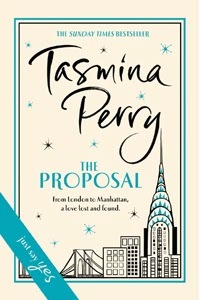 So you can imagine I was thrilled when I found out that the goodie bag all attendees to the event received included a proof copy of Tasmina's latest (not yet published) book, The Proposal. The book's cover is elegant and inviting, representative of its central storyline, and when I read the blurb I became even more excited to read this very interesting sounding story. As soon as I finished the book I was reading at the time I picked up this one and I raced through it in just a few days time as it was immensely gripping and I simply had to find out how it would finish. The storyline set in the past was particularly intriguing to me and so I was waiting with bated breath for its conclusion. And let's just say that even a month later I am still thinking about it, it's that good! I don't really want to see anything more about the content of the book as that might spoil it for prospective readers, but I can say that this is one fantastic piece of storytelling that has me wanting to read Tasmina's other books as soon as possible - and after you've finished The Proposal I can ensure you you will feel the same. You can pre-order your copy of the novel from Amazon.co.uk, Amazon.com or your own preferred retailer.